Based on verbal and published accounts by military witnesses and ET experiencers, active areas for extraterrestrial activity on Earth appear to include the Great Lakes region and the Hudson River Valley, the Gulf of Mexico, the Arctic, Antarctica, Australia and Europe. This is where we have witness reports, but other researchers can speak to the same phenomena occurring in other countries and regions such as Africa, Russia, Ukraine, Turkey, and countries near and in the Middle East. 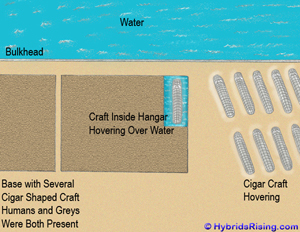 Some of the areas where U.S. witnesses describe extraterrestrial appearing craft entering and exiting large bodies of water include the Gulf of Mexico. There are numerous well investigated contact cases which have occurred along the Gulf Coast. The two most well known are Charles Hickson and Calvin Parker (The Pascagoula Case) and Ed and Frances Walters (The Gulf Breeze Sightings). 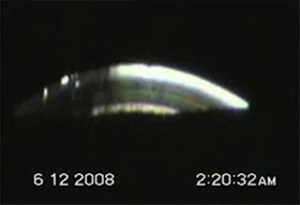 Even if you are skeptical of Ed Walters’ account of his events, the Gulf Breeze Sightings and associated ET contact, stand on their own as one of the best documented “UFO flaps” in the United States due to the number of other identified and investigated witnesses to the many sightings and Beings seen. While we cannot publicly identify every witness we are aware of who were living nearby at the time, we can say that some of AJ’s experiences occurred along the Gulf Coast of Mexico, as did Jim Sparks, and that some of the investigators even reported “unusual,” possibly ET related events in their lives. Another active geographic location is the Hudson Valley and Great Lakes regions. This is logical when one considers the geology and physiography of this area. The age, structure and composition of this region makes it a perfect location for technologically advanced Beings to “hide” from peering eyes, including technological eyes such as radar and space satellites. 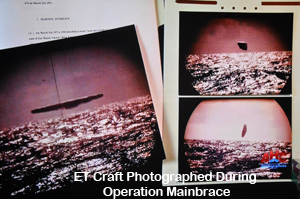 Experiencer AJ reported having encounters during which the craft they were aboard landed on a large object in the ocean, as well as on a somewhat stripped down naval ship as well as what appears to be ET-Human bases situated next to large bodies of water. This image is from an experience that occurred in 1992. A 2008 experiencer report revealed an encounter with a female who appeared to be a hybrid who stood approximately 5’ 6” and had dark blonde hair (a suspected wig). Her eyes were described as being similar to human eyes, but were the size of the Greys’. When asked where she was from, the Being replied that she was from “under the ocean.” We take this to mean, she and other “extraterrestrials” live underwater, probably in their huge craft and in underwater bases. Large bodies of water are a logical choice for these Beings to inhabit, at least while they have business here on Earth. And, it may turn out that they have been here a lot longer than humans. The Earth’s five oceans cover 129,432,254 square miles of our planet, which is an enormous amount of area in which they could be concealing themselves. A little over 70% of our planet is covered in water. If over 7 billion humans can live on land areas smaller than this, it isn’t such a stretch to reason that these Beings can exist on the same planet as we do and still not be seen very often. If they can fly their craft in space, there is no reason why they cannot navigate our oceans as well. 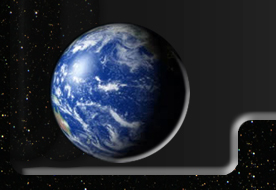 Earth’s oceans conceal mountains, volcanoes, oceanic trenches, submarine canyons, oceanic plateaus, and abyssal plains. An abyss is defined as a “chasm,” a “deep hole” and a “void.” These deep abysses and voids no doubt conceal most of the undersea activities of USOs or unidentified submersible objects; in other words, extraterrestrial craft. 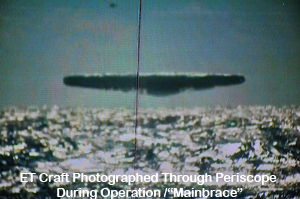 Another sighting covered during this episode involved a Russian nuclear submarine crew who witnessed 6 disc shaped craft that rose from the sea. 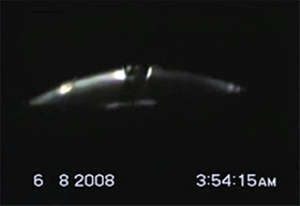 The six craft flew in a triangle formation and headed directly toward them at 265 miles per hour. The craft were never identified as being terrestrial, i.e., any known craft of the time. In Siberia in 1982, seven Russian scuba divers were exploring Lake Baikal which is the largest fresh water lake by volume in the world. 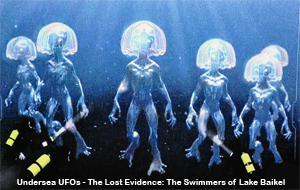 During their mission, they encountered extraterrestrial appearing Beings swimming underwater. They were described as larger than humans and appeared to be approximately 9 feet tall. They had some sort of membrane type head covering over their heads and wore silvery colored bodysuits. According to the artist’s interpretation, their feet had four wide “toes” with the larger toe being angled outward similar to an opposing thumb. 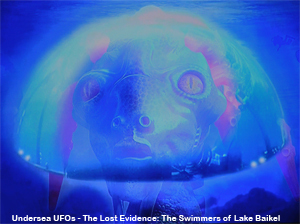 When the Russian scuba team tried to capture one of the ET appearing Beings with a net, some type of force – perhaps of a concussive nature – forced the Russian divers upward to the surface at a high rate of speed which led to the deaths of three of them. The other four were said to have been so shaken that they could not speak about what occurred. It is suspected that they were probably silenced by their government, just as American military and other individuals are forced to remain silent on the ET issue. Please check out our sources for more in-depth information on this subject. Look beneath the current presenter, scroll over to Debbie’s presentation and click the arrow to play. Turkey UFO Case on Wayback - Due to the political climate in Turkey, we urge everyone to visit and download this archived blog while it is still available. See also, UFOs are Real: Here’s The Proof. Bruce Maccabee and Ed Walters. There were at least 60 other people who reported sightings [some were ET Contact / Abductions] during the same time period as Ed Walters’ sightings. 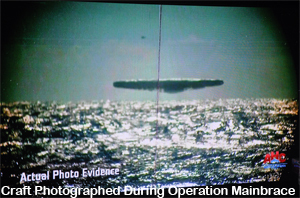 Undersea UFOs: The Lost Evidence: Operation Mainbrace, Sighting of 6 disc shaped craft, and The Swimmers of Lake Baikal. We highly recommend that you watch or purchase this episode. Hynek, J. Allen, Phillip Imbrogno and Bob Pratt. Night Siege: The Hudson Valley UFO Sightings. Llewellyn Publications, P.O. Box 64383, Department K362-X, St. Paul, MN, 55164. Marconi, Steve. Amazing UFO Sightings In The Hudson Valley, Hidden Technology & The Coming Great Deception. Trafford Publishing, United Kingdom, 2008.